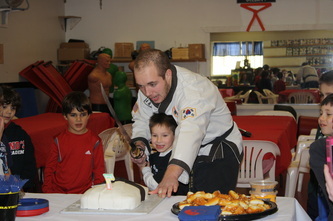 Who better to help celebrate your child's birthday than the fun and outrageous instructors at the Gentle Palm Academy? You've certainly seen the energy and enthusiasm our instructors put into their classes. 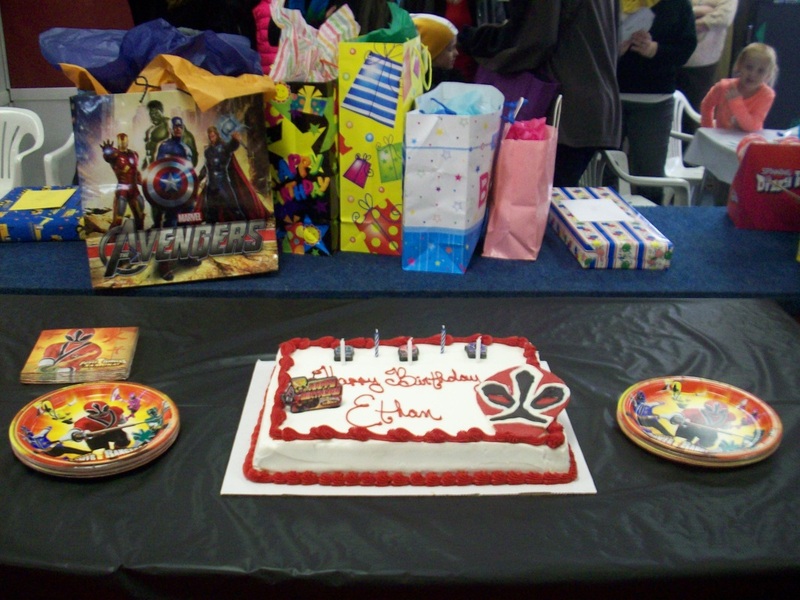 Now imagine that same energy mixed with the fun and entertainment of a birthday party. 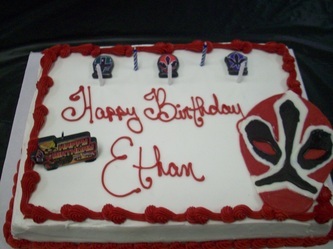 It will be one of the most thrilling and entertaining celebrations your family has ever experienced. 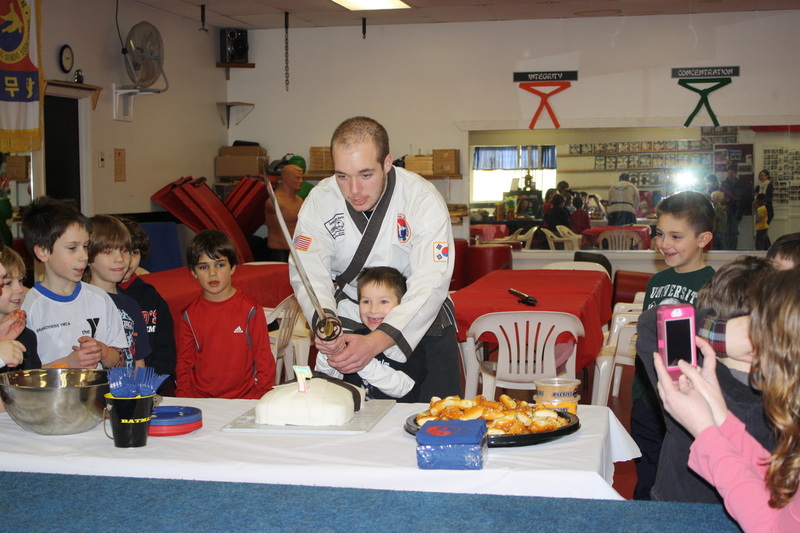 The fun begins with a specialized Karate class of martial arts games and fun drills. Then the instructors will serve the food. 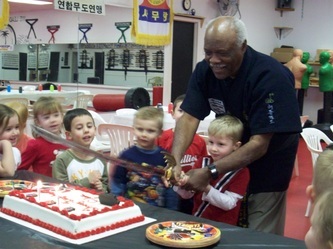 After the meal, the instructors will sing “Happy Birthday” and the birthday boy or girl will help the instructor cut the cake with a samurai sword. We wrap up the party with time for presents, including a special gift from the school to the birthday child. The red and blue circle is "Tae Keuk". It is an ancient symbol of the creation of the universe. The upper red section is Yang, the hard side and the lower section is UM, the soft side. The theory of Yang and UM is that in nature there are equal and opposing forces to keep things in balance and harmony. There are four sets of lines on the corners of the flag, in the upper left corner there are three lines which stand for Heaven. On the lower right side there are six smaller lines that stand for earth. On the lower left side there are two long lines with two smaller lines in between and they stand for fire. On the upper right there are four small lines with one long line in between and that stands for water. The Palm Tree signifies Perseverance and Flexibility that is needed in life. The Split Circle is the oriental symbol of equal but opposing forces in the universe (good and bad, love and hate, strong and week). The Olive Branches represent a desire to live in peace and harmony with all forces of nature. The Twin Dragons are the strong inner forces that protect each of us. The United Martial Arts Federation (UMAF) was created in late 1986 by Grand Master Young H. Kwon and his brother Grand Master Young K. Kwon. It's logo reflects a foundational philosophy. The logo is embellished by the six colors which represent the original belt system of the federation; white, orange, green, blue, red and black. Um/Yang: The circle in the center represents the essential unity of all being. The blue section "UM" and the red section "YANG" represent the ancient symbol of the creation of the universe, constant movement within the sphere of infinity in which there is also balance and harmony. The oriental symbol represents the universal concept of opposing but complimentary forces (fire and water, day and night, hot and cold, etc). Black Belt throwing side kick: The Black Belt represents maturity, respect and honor. The side kick signifies mastery of techniques unique to Martial Arts. Green Laurel Leafs: The twelve leaves symbolize the victory and full year cycle of growth. Globe: Viewing the entire world to spread the Martial Arts all over the world. Outer Orange Ring: A full circle of unity and brotherhood. 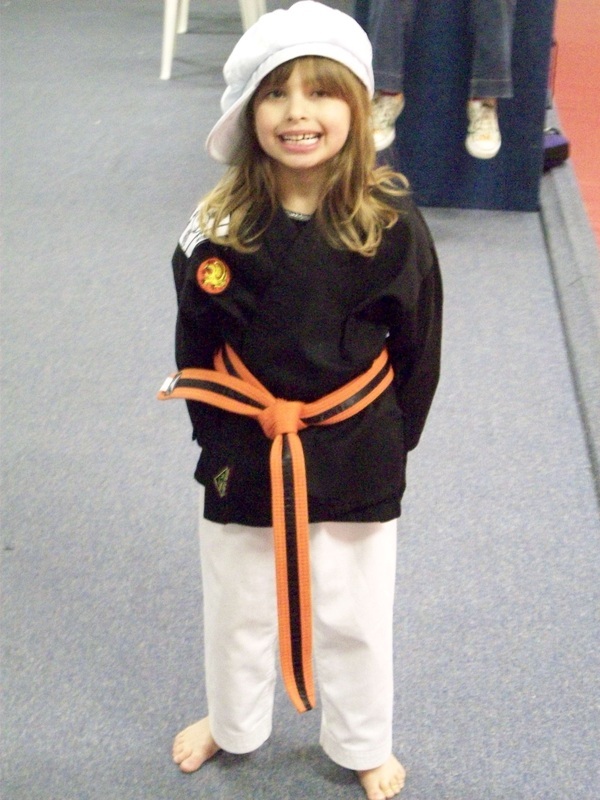 I'm going to be a Black Belt, one day soon. 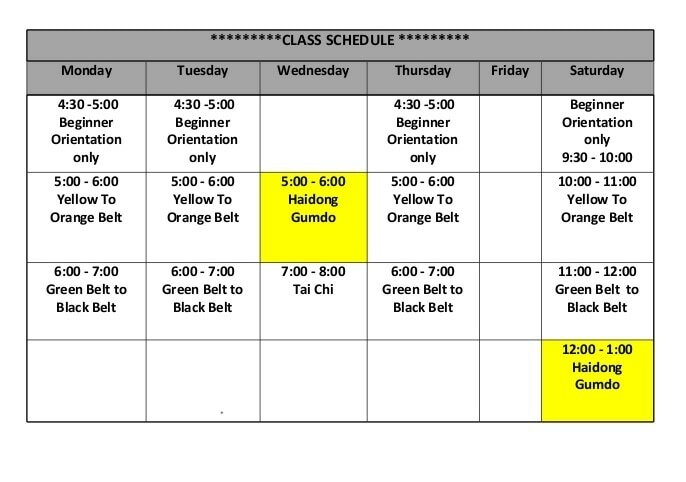 Dojang Rules Arrive at least 15 minutes before class is scheduled to start. If you are going to be late or unable to attend class, call your instructor and inform him. Upon entering the dojang, bow to the instructor. 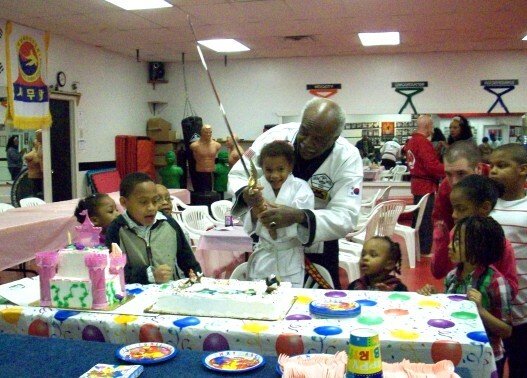 The student does not have to wait for the instructor to acknowledge the bow if the instructor is busy. Uniforms should be clean and pressed with the proper trim. Uniform markings must be limited to association patches and national flags, unless otherwise approved by your instructor. Salute (bow to) the flags upon entering the dojang. After signing in and changing into your uniform, go to the front of the dojang and sit facing the flags in the meditation position (muk yum). Meditation is an integral part of your training. It is the time to remove all outside distractions from your mind and concentrate on your training. 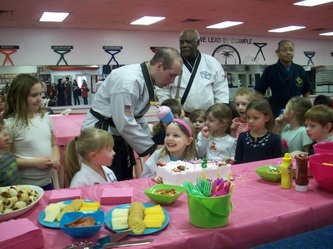 Students should bow to senior members when he/she comes into the dojang. Students should take initiative and assist in keeping the dojang clean. It is your school, take pride in its appearance. To avoid dehydration, drink plenty of water before class. After class has started, the student must ask permission to go to the water fountain&emdash;and then only to rinse the mouth. When the instructor enters the training area, the senior member should call the class to attention and bow to him. The senior member should then wait for further instructions. After preliminary warm-up and stretching, the instructor (or senior member, in his absence) will call on the class to line up according to rank. The senior will call commands for saluting the flags, mediation, and bowing to the instructor. In Eastern cultures, much importance is placed on the salutation (bow). It is an integral part of training and must be observed. All students should bow to the instructor, to his senior students, and also to his opponents. He should never lose self control, prudence, or composure. Before and after exercises or contests, the student should turn around, adjust their uniform and bow to their opponent or instructor. For centuries, martial artists have been renowned for the respect that their presence commands. There is a certain aura that surrounds them. This is not to be confused with their ego, but rather the respect they have earned. The tradition of bowing, therefore, seems only natural. In ancient times, as well as today, this gesture is done as a courtesy; showing respect to instructors and fellow martial artists. 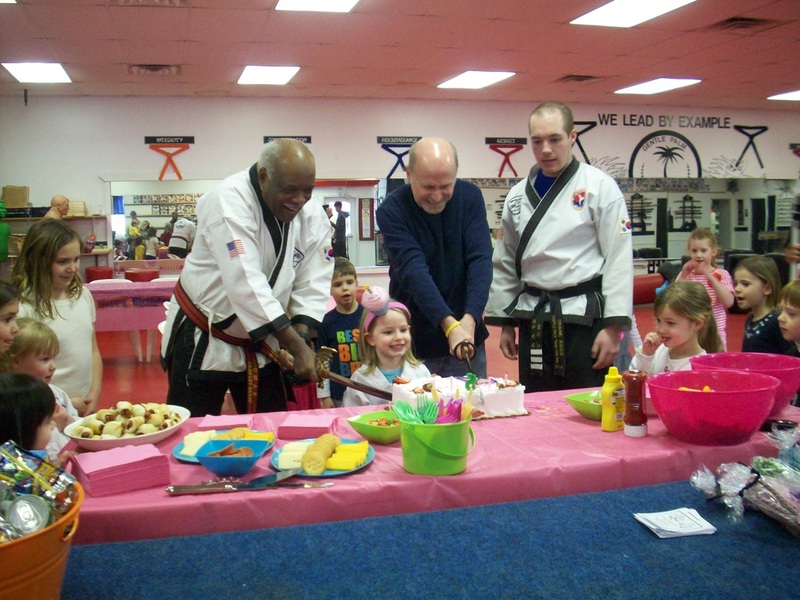 When we bow to a master instructor, we are acknowledging his/her skills and expertise in the martial arts. The bow also signifies gratitude for the skills being taught. Regardless of style, rank, or age, the bow conveys a silent message of appreciation. Recognizing and appreciating the talents of others with a "thank you, sir" or "thank you, ma-am" goes hand in hand with the tradition of bowing. In the sparring ring, the bow represents respect for one's opponent as well as towards the senior who is controlling the match. Pride, honor, and respect for our county and our school are conveyed as we enter the workout area and bow towards the flag. 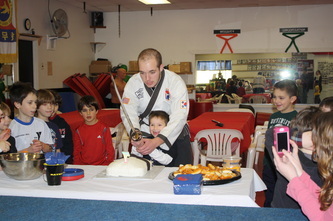 We are grateful for the freedom to assemble and learn martial arts, and must demonstrate that appreciation. Respect, honor, gratitude, and humility are qualities that the martial artist incorporates into his daily life, regardless of where he is or who he is with. The gesture of bowing symbolizes a philosophy and way of life that never goes out of style.